The huia was one of only five species that made up the entire endemic Callaeidae family of New Zealand wattlebirds. 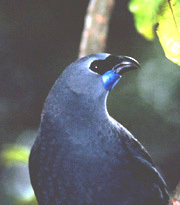 The South Island kokako Callaeas carunculatus is also extinct. There are just three surviving species of the Callaeidae family today - North Island kokako Callaeas cinerea, South Island saddleback Philesturnus carunculatus, and North Island saddleback Philesturnus rufusater. The wattlebirds of New Zealand are not found anywhere else in the world, and the huia was the world's only bird with completely different beak forms in the male and female. The ancient Callaeidae family flew to New Zealand 60 million years ago, and like many birds in the isolated archipelago, adopted ground feeding habits in an ecology devoid of mammalian predators except for three bats. The huia was unique as the only bird in the world with completely different beak forms in the male and female. While today we are astounded by the ruthless hunting of huia to extinction during a very short period, and the ignorance of the time, even amongst respected ornithologists, we are left with no excuse for more bird losses with current knowledge of the value of biodiversity. The huia was probably New Zealand's most eccentric bird - a large 48 cm (19 inch) black bird with a bright orange "wattle" at the base of an ivory beak. It had a distinguishing wide band of white at the end of its long tail feathers. Huia were so sexually dimorphic, and unique because of the different beak forms of the male and female, that they were at first thought to be separate species. They were normally found feeding in pairs in cooperative roles. The male used his short strong beak, which resembled the beak of a starling, to break up rotting tree trunks in search of huhu bugs and other insects. The female's long curved beak like a nectar feeder's, could get into places otherwise unreachable. 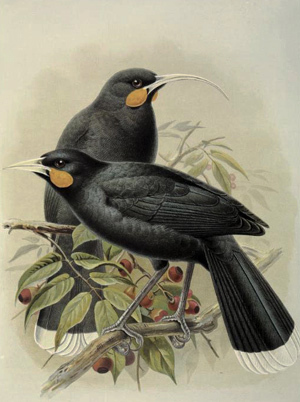 Image - John Gerrard Keulemans 1842-1912, Huia Heteralocha acutirostris 1888. Permission of the Alexander Turnbull Library, Wellington, New Zealand must be obtained before any re-use of this image. Huia extinction is sadly associated with an international fashion of wearing their beautiful, long, white-tipped tail feathers in hats. Huia feathers are a traditional Maori symbol of authority and high prestige, reserved for special ceremonies. Gradually Maoris with any claim to chiefly rank wore at least one feather as an occasion required. European men adopted the custom, which peaked after 1900. During a royal welcome of the Duke and Duchess of York in Rotorua around the turn of the 20th century, a guide took a huia feather from her hair and placed it in the band of the Duke's bowler hat. This set off a world fashion trend that was devastating for huia survival. 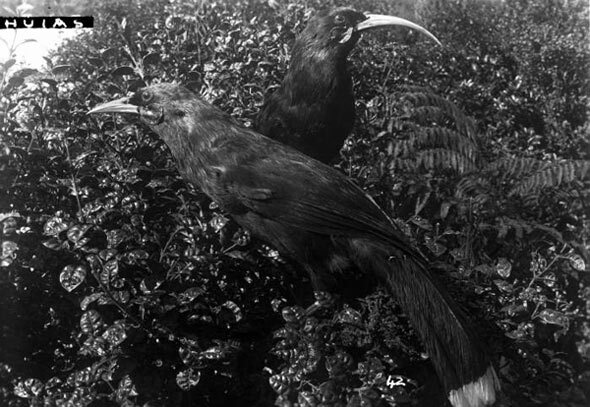 Tail feathers for men and women's hats, stuffed birds for collectors, and skins for museums were in such demand, that huia were hunted vigorously. It is estimated that several thousand specimens were sent to museums in Europe and the United States during the last half of the 19th century. 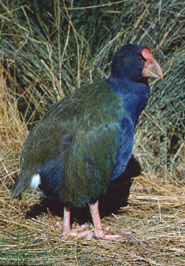 The notable ornithologist Walter Buller, who killed large numbers of huia himself for museum collections, reported that a Maori hunting party collected 646 huia in a month. The Duke of York's visit obviously affected the plight of the huia, but so did other impacts. It was plentiful around 1880 before going into rapid decline. Clearing of native habitat, and introduction of ferrets, stoats and weasels in the 1880s to control rabbits were part of the cause of huia extinction. Huia had their own species of louse Rallicola extinctus, which went extinct along with its host. Specimens of the louse, which lived in and fed on the huia's feathers, have been recovered from bird skins preserved in museums for 100 years. The louse was recently discovered on the old huia skins, and has never been seen alive. The Callaeidae family with just three genera, and three living and two extinct species is highly distinguished, because the entire family is endemic. The Callaeidae is one of 21 families of New Zealand birds, reptiles, frogs and bats that are not represented anywhere else in the world. The super family Strigopoidea containing the Strigopidae (kakapo), and Nestoridae (kea, kaka) families is also endemic to New Zealand. Kakapo, Leiopelma frogs, piopio and stitchbird are the sole species in their families, Mystacina (three short-tailed bats) is the only genus in it's family, two Sphenodon species of tuatara are the only members of its familiy and its order, Apteryx (kiwi) is the only genus in its family and order, and three families of moa are the only members of their order. Buller WL, A History of the birds of New Zealand, Sir Walter Lawry Buller, London 1888, The New Zealand Electronic Text Centre (Creative Commons Attribution-Share Alike 3.0 New Zealand Licence). Clout MN, Hay JR, The importance of birds as browsers, pollinators and seed dispersers in New Zealand forests, New Zealand Journal of Ecology, Vol 12 (supplement) 1989. Kelly D, Ladley JJ, Robertson AW, Anderson SH, Wotton DM, Wiser SK, Mutualisms with the wreckage of an avifauna: The status of bird pollination and fruit-dispersal in New Zealand, New Zealand Journal of Ecology, (2010) 34(1): pp 66-85. Oliver WRB, New Zealand birds, AH & AW Reed, Wellington 1955. 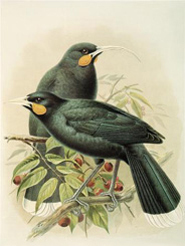 Image left: A male (left) and female (right) huia Heteralocha acutirostris. Permission of the Alexander Turnbull Library, Wellington, New Zealand must be obtained before any re-use of this image.